Cognitive Neuroscience – in the investigation of learning, memory, creativity, speech, hearing, visual, perception and functional connection, cognitive enhancement. Psychiatry – to influence specific brain function within the dorsolateral prefrontal cortex To relieve anxiety, depression, bulemia (bulimia),schizophrenia and depersonalization as a better alternative to Electric Shock Treatment also called ECT. Neurophysiology – used in the stimulation of the peripheral and central nerve pathways. Eliciting motor evoked potentials to advanced brain mapping research techniques. Rehabilitation – used in the promotion of muscle recovery and the relief of pain and nerve spasticity. 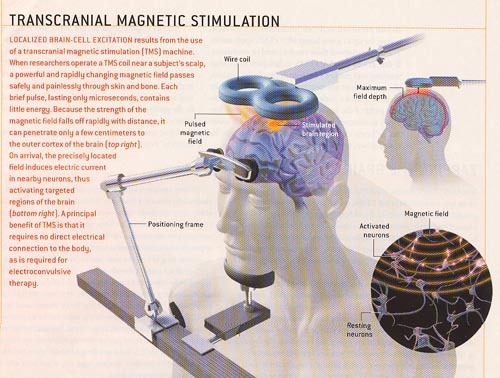 Transcranial magnetic stimulation (TMS) is a technique for gently stimulating the brain. It utilizes a specialized electromagnet placed on the patient’s scalp that generates short magnetic pulses, roughly the strength of an MRI scanner’s magnetic field but much more focused. The magnetic pulses pass easily through the skull just like the MRI scanner fields do, but because they are short pulses and not a static field, they can stimulate the underlying cerebral cortex (brain). Low frequency (once per second) TMS has been shown to induce reductions in brain activation while stimulation at higher frequencies (> 5 pulses per second) has been shown to increase brain activation. It has also been shown that these changes can last for periods of time after stimulation is stopped. TMS was first developed in 1985, and has been studied significantly since 1995. TMS is not Vagus Nerve Stimulation or Acupuncture. What disorders has TMS been shown to be useful for? TMS is currently being investigated as a potential treatment for patients with major depression, patients who experience hallucinated “voices” and a variety of other psychiatric and neurological disorders. Over 1500 patients have been studied with TMS. For patients with major depression, many, but by no means all studies have shown clinical improvement following TMS. Recent studies that have used newer technology and stronger stimulation have shown much improved results. These pilot studies have taught researchers about how to better use TMS for depression. For patients reporting auditory hallucinations (voices), research has not been as extensive but initial results have been promising and suggest that low frequency TMS administered to parts of the brain underlying speech perception may reduce these voices. The Food and Drug Administration has not approved TMS for any psychiatric treatment at this time. Therefore TMS is only available as a research procedure. TMS has been approved in Canada and Israel as a treatment of depression for patients who have not responded to medications and who might ordinarily be considered for a trial of electroconvulsive therapy (ECT). Do you need to get anesthetized for TMS? No. TMS is an outpatient procedure and does not require anesthesia or an IV. It can be administered in a physician’s office or clinic. Approximately 5-10% of patients experience discomfort at the site of stimulation. In general this has not been a problem when administering TMS to patients volunteering for research studies. It depends on the research protocol, but generally each session takes about a half an hour. One procedure includes 2 daily sessions approximately 20 minutes each, with a 30-minute break between them. It is performed for 10 days, with a rest period of 2 days between the first 5 days and the second 5 days. There are 20 sessions in total. Are there any side-effects or risks associated with TMS? Yes. The main risk of TMS, as with any pulsed energy, is inducing a seizure, though with close monitoring this complication has been very rare. No seizures have been reported in the scientific literature since safety guidelines have been implemented. For stimulation at low frequency (1 to 5 pulses per second) there have been no reports of seizures. Insofar as the brain is directly stimulated by TMS, there is a potential risk of disturbing the brain’s normal functions. However, in depression studies reported so far, no cognitive side-effects like loss of memory, negative changes in concentration and other cognitive capacities have been reported. This is in stark contract to the well known cognitive side effects associated with electroconvulsive therapy (ECT). Is TMS widely available to patients in the U.S. and Canada? TMS is not yet FDA cleared but has been approved in Canada and can be purchased from Biophysica. Why are researchers evaluating TMS? TMS has some very unique properties. It is non-invasive, (does not break the skin and can be delivered in a physician’s office) can easily be focused on small areas of the brain, and can change brain activity. This makes it particularly well suited for treating the brain, while minimizing side effects typical with other psychiatric treatments which affect areas of the brain and body not involved in the disorder. Specifically for major depression, researchers understand there are a significant number of patients suffering from this disorder that are not helped by the available medications and other therapies, only receive partial benefit, or are not able to take medications at all. TMS offers hope that, if proven effective, many of these patients may be able to experience symptom relief. The therapy, called transcranial magnetic stimulation (TMS), involves using brief powerful electromagnetic pulses to alter brain activity. The U.S. Food and Drug Administration (FDA) has approved the therapy for patients whose depression hasn’t improved with medications – estimated to be from 10 to 20 percent of those with the illness. Patients treated with TMS may experience total remission of depression symptoms. A 50 percent improvement in depression symptoms is common. A typical treatment schedule involves five, one-hour sessions a week for at least three to five weeks. During a session, the patient sits in a reclining chair while the magnetic coil is positioned and activated. Patients remain awake and alert as the coil alters brain activity. No anesthesia or invasive procedures are used. The benefits gradually emerge over several weeks. A recent study compared TMS therapy in a group of people who had drug-resistant depression to a matched group of patients who received an inactive placebo form of TMS therapy. After four to six weeks, the TMS group was twice as likely to have remission of depression symptoms as the group receiving the placebo treatment. While TMS is being used to treat depression at select medical centers, there are still many unknowns. Researchers don’t know how long the benefits might last. The general belief is that most patients who improve with TMS will continue to need some ongoing therapy for depression, whether it’s medication, counseling, additional TMS sessions or some combination of these therapies. Magnetic brain therapy gets US green light at New Scientist http://www.newscientist.com/article/dn14998-magnetic-brain-therapy-gets-us-green-light.html “more than half of depressed patients showed an improvement in symptoms after receiving five 40-minute TMS sessions per week for four to six weeks”. Magnetic Brain Stimulation for Sleepiness, Memory Impairment, Anxiety Disorders and Schizophrenia (As the researchers wrote in the journal Cerebral Cortex, “TMS recipients were speedier in memory tests following the treatment” at Columbia University (funded by the Department of Defense). Magnetic Brain Stimulation Helps Depressed, Study Shows, Jan. 15, 2001 at Medical University of South Carolina. Conditions treated auditory hallucinations, depression, schizophrenia, multiple sclerosis, Parkinsonism, post-stroke, Pain After Spinal Cord Injury, tinnitus, Panic Disorder, epilepsy, regional pain syndrome, migraine. Which tinnitus patients benefit from transcranial magnetic stimulation? Our electric and magnetic devices emit energies that are similar to established proven technologies and may be helpful in similar situations. Our specific devices have not been scientifically proven to achieve equal results and are experimental and custom built.